Allow yourself your individual wishes! For a good live entertainment you will need a tailormade program. More than 25 years we have been testing and developed race-events successfully. 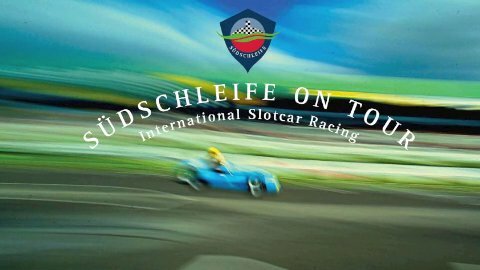 We will make proposal to integrate our SÜDSCHLEIFE-event into your planned event-schedule. therefore we will create sporting and technic regulations as required. Then you will prompt the schedule for your event and location. We arrive and construct the racetrack for you. With illumination, flashing amber lights for marshals/code 60, sound exposure for track speaker as well as background music, time keeping and countdown lights for free practice as well as qualification sessions and races. Race director, time keeper, marshals, service installers track speaker and the music we will bring with us. As well we will bring a Cup Series with us. 9 equal Porsche 911 Carrera Cup sportscars scaled in 1/24 we bring for your race of Champions to the grid. Please tell us your individual wishes, if this does not meet your requirements. Perhaps you appreciate races with authentic sportscars or saloon-cars from the 60s or 70s, e.g. a Ford Capri or BMW 3.0CSl or a Ford GT 40 as well a Porsche 917k. We will bring Bolids scaled in 1/24out of the glory days of the legendary Südschleife. Or you appreciate race models out of the American NASCAR Series or a Cup races e.g. with BMW M3 GT4 or aMINI Cooper Challenge? Or you need goblets or even laurel wreathes for your guests? What ever you desire to implement an unforgettable, individual event for your guests: we are here for you.